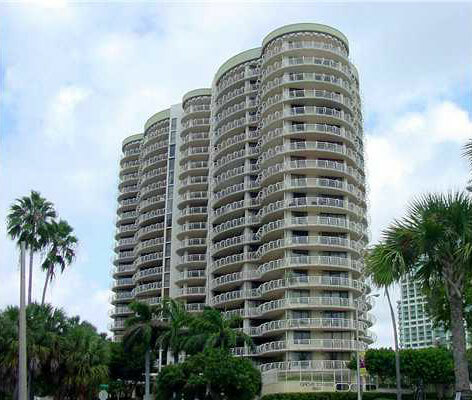 Just one block to the west of Biscayne Bay is Grove Towers in Coconut Grove, a nineteen story building featuring over eighty Coconut Grove condos for sale available with two, three or four bedrooms. As a resident of this building you'll always be near parks, great shopping and much more. The units of the Grove Towers condo have 1,460 to 3,364 square feet of living area and you will also find penthouses available if you wish to upgrade to a larger residence. Expect to see features like stainless steel kitchen appliances and bathrooms in marble. Many residents also enjoy corner views and wraparound terraces thanks ot the design of the building. As for pets, they are allowed if you actually own a unit but tenants may have restrictions. Look for tennis and basketball, a swimming pool and modern fitness center as part of the amenities you will come across at Grove Towers. There are several places you can walk to from Grove Towers like Kenneth Myers Park, the Improv Comedy Club across the street to the west and CocoWalk which is home to a collection of shops and restaurants. Coconut Grove is also the home of Vizcaya, a classic villa with beautiful gardens to explore. Visit the Fresh Market to the northeast or explore neighboring cities and areas like Coral Gables and Downtown Miami.